Today is a special day and one of reflection for me as I sit on my favorite tabby bench at Musgrove overlooking the marsh. It was here that my grandmother reminded me of the importance of protecting the environment and giving back to the community. My grandmother was ahead of her time in many ways and it has inspired me to look ahead as well. To that end, it is with great sentiment and a focus on preservation for future generations that I join the St. Simons Land Trust in celebrating the closing of the final phase of Musgrove. Thank you to the community that embraced this opportunity and to the many thoughtful friends, colleagues and partners that helped to make this monumental event part of my grandmother’s legacy and Musgrove’s history. The St. Simons Land Trust, the Brenn Foundation, and the Georgia Department of Natural Resources have finalized a multi-phase, multi-year major land conservation partnership on the north-end of St. Simons. Nearly half of the historic estate known as Musgrove has been sold by The Brenn Foundation to the Land Trust. The total 258-acre purchase makes this the second largest acquisition in the Land Trust’s 18-year history and one of the most important land protection projects ever initiated on St. Simons and the Golden Isles. Musgrove is the former home of environmentalist and philanthropist Nancy Susan Reynolds and her son, Smith W. Bagley, heirs of the R.J. Reynolds Tobacco Company. Purchased in 1938 by Nancy Reynolds, the 550-acre compound was built as a natural sanctuary and informal philanthropy center based upon the principles of giving back to the community. As a continuation of that mission, former President Jimmy Carter was invited to host his pre-inaugural cabinet meeting at Musgrove after the 1976 U.S. presidential election. That event sparked the late Smith Bagley’s founding of The Brenn Foundation to serve as steward of the Musgrove Retreat and Conference Center. Today, the Foundation continues to host dignitaries, thought-leaders, and organizations from around the world that focus on public policy issues such as the environment, human rights, and civic engagement. “I’m delighted to learn that the Bagley family, in their generosity, has partnered with the St. Simons Land Trust to preserve this unique and beautiful property,” said President Carter, who was the recipient of the Bagley family’s hospitality many times over the years. “I know that future generations will enjoy Musgrove as much as I have,” added the former president. Conversations between The Brenn Foundation and the Land Trust to save the property began more than five years ago. The first 58-acre parcel was purchased in 2016. The second 90-acre phase closed in February of 2017. This month the final 110-acre tract was sold to the Land Trust. The Georgia DNR also provided $3 million in grants obtained through the U.S. Fish and Wildlife Service. Governor Nathan Deal approved each of the three $1 million grants as well as a perpetual conservation easement that ensures the property can never be developed. The total purchase price of the 258 acres was approximately $11 million. As part of the agreement, The Brenn Foundation is returning a prorated amount from each of the three closings – roughly a total of $1.5 million -- to the Land Trust for a stewardship endowment to help support the property’s perpetual care. Also, as part of the agreement, the land purchased by the Land Trust will be renamed, with The Brenn Foundation retaining the name “Musgrove” for the acreage it holds. During the next 12 months the Land Trust will begin opening sections of the land to the public. In addition to providing hiking and biking trails and opportunities for fishing, birding, kayaking, and other outdoor activities, the property is a major boon to conservation efforts on the island. According to Jason Lee, a manager at the Georgia DNR’s Wildlife Resources Division, “The Land Trust acquisition will continue to provide both upland and saltmarsh habitat, in perpetuity, for manatee, diamondback terrapins, migratory birds and other rare plants and animals, plus allow for outdoor public recreation in the Golden Isles. The saltmarsh performs invaluable services such as reducing storm surge impact to adjacent uplands, minimizes erosion, and supports essential habitat for fisheries as well as threatened, endangered and protected species. The State is excited to partner with the SSLT for these reasons,” said Lee, who co-authored the successful grant proposals awarded through the U.S. Fish and Wildlife’s competitive National Coastal Wetland Conservation Grant program. The property’s marsh also abuts and adds to the Altamaha River Corridor, which has been called by The Nature Conservancy one of the “75 Last Great Places in America”, and has been a conservation priority of DNR’s for the past 25 years. The St. Simons Land Trust is a community institution whose mission is to preserve the island’s natural and scenic character and to enhance the quality of life for present and future generations. Founded in 2000 by a group of residents who were concerned about the pace of development on St. Simons, today the Land Trust manages and protects more than 1,000 acres of land and is supported by more than 1,200 annual memberships. It is an accredited member of the national Land Trust Alliance. To learn more, visit sslt.org, call 912-638-9101, or follow the Land Trust on Facebook, Twitter, and Instagram. The Brenn Foundation serves as steward of the Musgrove Retreat and Conference Center and focuses on public policy issues such as the environment, human rights, and civic engagement. It continues the tradition of hosting philanthropic and other special events throughout the year, providing its serene and picturesque environment as a respite from the outside world and offering guests a unique opportunity for group discussion, debate, learning and planning. The name of the estate has become synonymous with thoughtful gatherings that discuss issues of topical interest that have strategic and tactical importance. For more information, please go to www.musgroveretreats.com or call 912.388.9008. 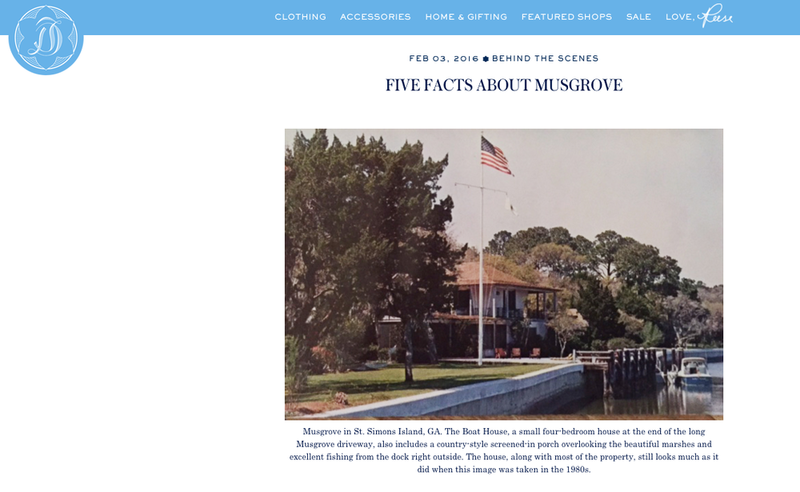 Musgrove Featured in Golden Isles Magazine! Musgrove Featured in The Permanent Tourist Blog!